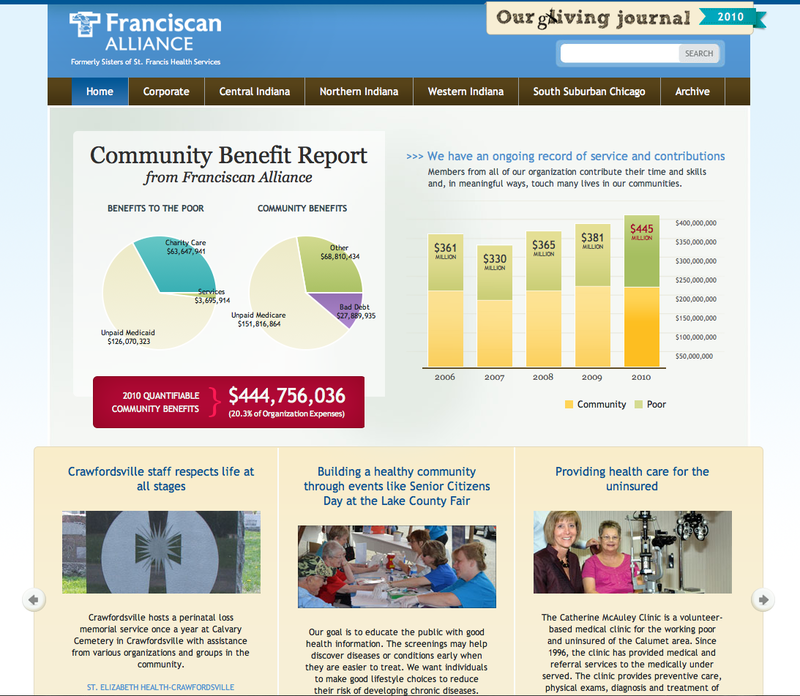 We launched a Community Benefits website for Franciscan Alliance today. We handled web design, HTML and CSS build, and managed the overall project. In 2008, the Franciscan Alliance came to TBH Creative with the need to display their community giving total through a website. 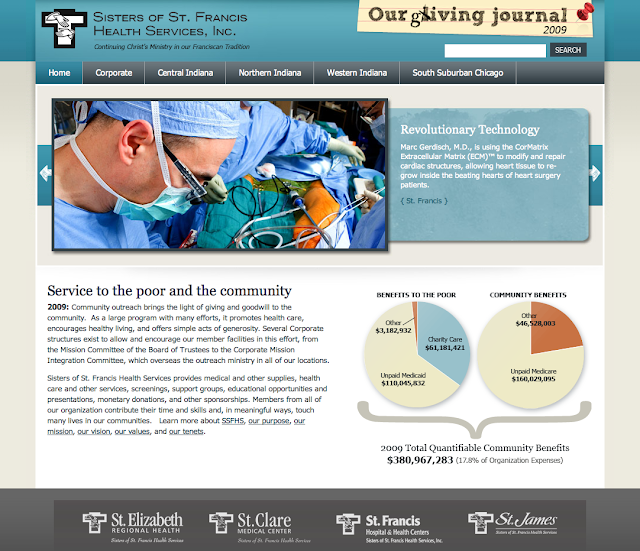 The website serves as a report of annual community giving. We prepared the website in and 2009. For 2010, we wanted to add some new elements and stronger impact. Part of the enhancements were JQuery pie charts to add a little interactivity. 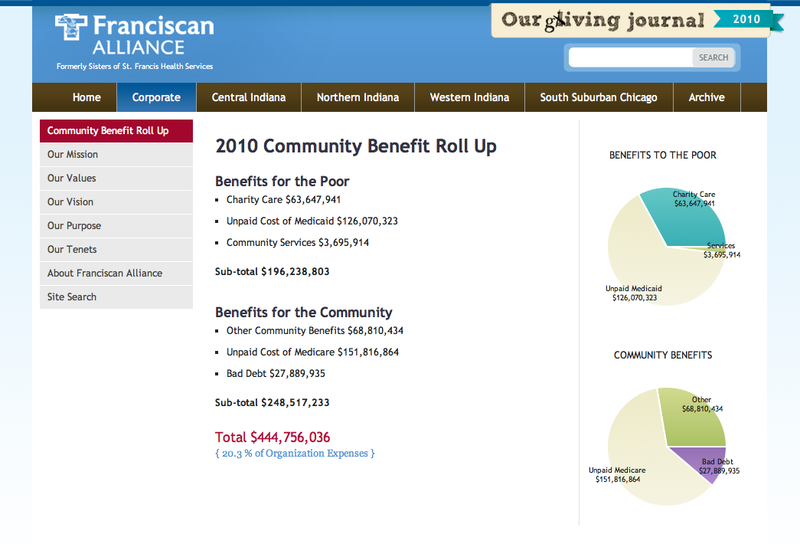 We also redesigned the home page to emphasize and show off the amount they give to the community over years. In 2010, they gave a total of $444,756,036. Franciscan Alliance has endeavored to stay true to its founding mission of caring for everyone who comes through our doors. As they have for over 130 years, Franciscan Alliance continues to look for opportunities to serve communities through the very best in medical care and service to the less fortunate among us. The following report reflects their mission of, “Continuing Christ’s Ministry in our Franciscan Tradition.” Although it is not all inclusive of the many benefits provided, it does portray the significant benefits that reflect the organization’s commitment to healthcare and the communities they serve.